Lee Chung-ryoul’s documentary Old Partner was a surprise hit in Korea in 2009, expanding through word of mouth from an initial release on seven screens to becoming number one at the box office, beating out both Hollywood blockbusters and high-profile local releases. The popularity of the film grew to such an extent that the director made appeals to the public to prevent them from overrunning Choi Won-gyoon and Lee Sam-soon, the bickering, cantankerous husband and wife farmers who are the film’s subjects. The producers of the film worked with police to launch a special campaign to prevent illegal downloading of the film. All of this seems a rather counterintuitive fate for such a quiet, observational film concerning an old couple and their work ox, all three of whom are in the very late stages of their lives. But when one actually sees the film, it is easy to see why the film struck such a deep chord when it was released in Korea. Many people who saw this film almost certainly saw their own parents or grandparents in this couple, whether they were farmers or not. 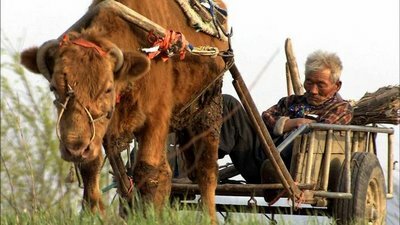 The dying ox in Old Partner is a huge bone of contention between the couple. Choi dotes lovingly on the ox, and talks about how important this animal is, how it helped to feed his nine children and send them to college. The couple’s way of life seems virtually unchanged from that of similar people centuries ago. There is no internet, cell phones, or television; their only connection to the rest of the world is a beat-up old radio. Lee resents her husband for taking better care of the ox than his own wife; she constantly laments her rotten luck in life, saying over and over that she “picked the wrong man,” and complains that she has been worked so hard over the years that she now cannot stand upright. The couple suffers from as many ailments as their ox: Choi’s leg was ruined by a bad acupuncture job when he was a young boy, and now awkwardly gets around on a cane. The couple has many grown children, but Lee doesn’t want to live with them, even though presumably her life with them would be infinitely more comfortable than what we see on screen. “Better to die than to have to walk on eggshells all the time,” she says. This is a hard life, but obviously one lived by choice, by a couple who puts a premium on proud self-sufficiency. Even though the couple seems to exist in complete isolation from the outside world, the film astutely shows us that their lives are very much affected by events in the larger society. In one scene, as Choi drives his ox on the street, he passes a demonstration against the Korea-US Free Trade Agreement, which among other things is helping to drive down cattle prices. This fact becomes pertinent to a later scene in which the man attempts to sell an unruly calf and is told that it is too small, and that prices are going down because the Korean markets are now being opened to American beef. When Choi passes the street protestors, a man on a megaphone yells, “Here come one of the mad cows now!” This is a reference to the massive protests that occurred when President Lee Myung-bak announced he would relax the ban on American beef (a key component of the Korea-US FTA), raising concerns among many that tainted American beef would enter the Korean market. The film ends with a dedication to the farmers who fed their children and sent them to school with the fruits of their hard labor, and who have now been nearly forgotten in the modern technological world. Old Partner beautifully and movingly honors a way of life that is rapidly disappearing, and although to all appearances this is a harsh and unforgiving existence, it is unfailingly respectful and sympathetic toward the old man at its center, while not shying away from the less appealing aspects of his personality, such as his neglect of his wife and his ornery stubbornness. However, one cannot help but have admiration for Choi’s reluctance to give up on his trusted animal companion, and his refusal to use machines or pesticides on his land, even though this would make his work much easier. He lives, and will die, by his unyielding insistence on doing everything by hand, and remaining connected body and soul to the soil that literally gave him life. Old Partner won the Mecenat award for best documentary the 2008 Pusan International Film Festival and had its US premiere at the 2009 Sundance Film Festival.